Media mogul Barry Diller had some harsh words about Donald Trump on Thursday. "There's nobody that I've ever known, ever, that's risen to the presidency that was actually of evil character," he told CNBC's "Squawk on the Street." "Anybody who attacks people in the manner that he attacks people … that's evil." Soon after Trump swept to a strong victory in Indiana on Tuesday, his two remaining opponents — Sen. Ted Cruz of Texas and Ohio Gov. John Kasich — suspended their campaigns. With no one standing in his way, Trump ascended to the status of presumptive Republican nominee. Diller is also a supporter of Democratic front-runner Hillary Clinton. In the same interview, Diller, Expedia's chairman, said he was optimistic the travel giant would survive the rise of start-ups like Airbnb and HomeAway. "Airbnb and HomeAway are going to take pieces out of the standard, vertical hotel business, but they're not going to take it all away," he said, adding that hotels remain appealing to business travelers and other leisure travelers. Diller acquired Expedia in 2003. "Expedia had been in business for a couple of years, and actually the leader was Travelocity at the time. That was really the first one that went in, but Expedia came in and undercut them essentially. So I went to see [former Microsoft CEO Steve Ballmer] and I said: 'You guys don't want to own this. … It's not your business," he said. Ballmer later agreed to sell Expedia. 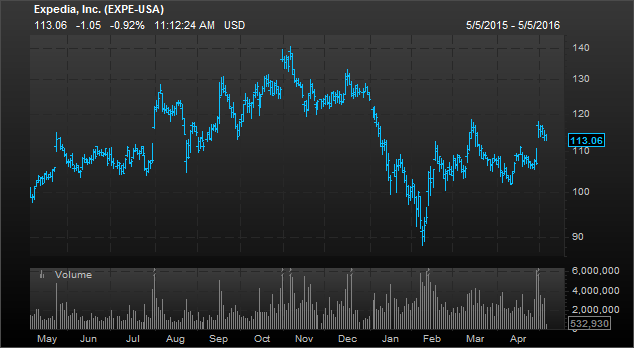 Shares of Expedia have performed well over the past year, adding more than 14 percent in that period.